When we purchased our first house, I knew we would need a shed in the backyard for all our stuff, but I didn’t know too much about building structures like garden sheds or greenhouses. We looked at garden shed plans and decided for my first outdoor project it would be easier to purchase a shed kit. The shed kit was great for us newbie's, because it came with the plans, pre-cut wood, and all the necessary hardware. I found out later that you can also order kits that have major pieces like walls pre-assembled which saves even more time and effort. But these cost a bit more and you will not learn as much when you assemble it. 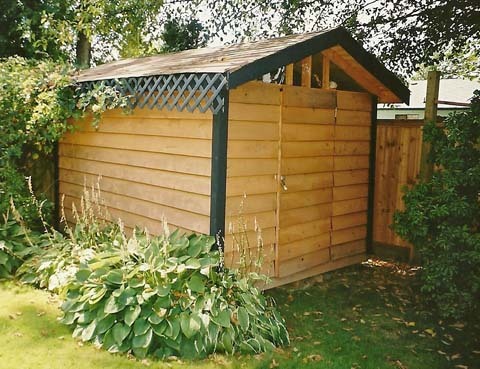 There are lots of different places where you can order shed kits. If you do not have one in your area you can order them online. For this project I went to Sunbury Cedar. They have a great selection of kits, they build them on site and I like their quality. Soon after I ordered the cedar shed kit, it was delivered on a large pallet. It was then that I started to get a little worried because I had never built anything this big before. I started talking to friends and quickly found a few who were avid woodworkers or do-it-yourself renovators. That’s when I got the idea to have a shed building party and invite my skilled friends over to help out. I figured for the price of food and beer, I could get professional help. I picked the date and hoped for a sunny day, and then I started working on site preparation. Since our friends were coming over to build, I decided it would be smart to have the site prepared before they showed up. I found out that this was a good idea, because it took some time to level the site and get everything prepared to start construction. If I had waited for my friends to show up, there would have been a lot of waiting around going on and no progress on my shed. The plan for the party was to have the workers (friends) show up around 9:00 a.m., and then have their families show up later in the day for a barbecue dinner to admire what we built. This was the proof that we didn't sit around all day and drink beer. I planned to have fresh beverages on tap, and to supply lunch and snacks throughout the day. It’s always a good idea to ensure your crew is nourished and hydrated while working on your shed! As planned, people began arriving at 9:00 a.m. with various tools, and we soon got to work. It was interesting to see how everyone had a specialty in one form or another. One friend who was not good with swinging a hammer or using power tools, was a master when it came roofing. He had worked as a roofer one summer while going to college and he was in charge of the roof. The shed building party turned out to be a big success and I was surprised how much fun everyone had building my shed. I also learned a lot about building outdoor structures. We now have a yearly building project at someone’s house, and to date we’ve built a barn shed, deck, kids playhouse castle, and a tugboat sandbox. If you think a shed building party is your future, here’s a few things from our experience that you might find useful. Plan to provide lunch for everyone. At one of our building projects, they had buns, bread, cold cuts, etc. and everyone could make their own sandwiches. Have lots of water and juice on hand, especially if it is hot. Plan the building party early in the summer when the days are long and you can maximize your building time. Don’t mention this to your friends, though. Don’t get too worried if there is the odd bent nail or wrong cut. You will never notice it once the project is complete. Discuss with your friends about making modifications and improvements. For example we added some Plexiglas near the top to let in natural light. Have a camera handy for pictures, especially near completion of your shed. You will want a picture of all of your friends who worked on it. Looking for garden project ideas? Get reviews, tips and ideas in the FREE "LearnAbout Garden Newsletter"